Cinderelli! Cinderelli! (as the little mouse called her)....It's Disney Princess time with Cinderella! 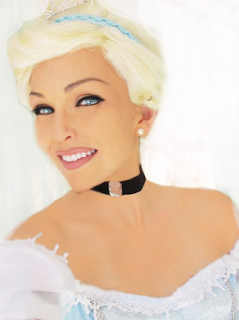 I love, love, love getting to dress up as a princess....and especially Cinderella. Get ready for this fun princess adventure video and look...sit back, put your brooms & mops down, and hunt for your glass slippers!!! Let's watch and have fun with this Cinderella makeup tutorial!!! wonderful tutorial...love the complete look! U're a genius..
omg u made me cry at the last part with the song Thank you! I love the fact that UD has a latex free glue since I am very allergic to latex. Great job once again Kandee. Kandee you're so crazy, you are beautiful without make-up as much as you are with! Your Cinderella impression was crazy good! OMG you look soo gorgeous!!! Omgoshhh!! Cinderella is my fave, so this is my fave so far! LOVE LOVE LOVE! that smile and that hair.....you look like that lady from the devil wears prada! Very beautiful! And you have a very nice singing voice too. Might not be too late to work at DisneyLand...';0) As you have said, never give up on your dreams. Love it! Maybe an Alice in Wonderland look? Not from Tim Burton's film though; that Alice looks too pale! The cartoon Alice has much more color to her! Dang! When you posted the teaser yesterday, I was sure it was Storm. So, I think Storm would be an awesome costume look for you to do. Thanks so much for all your videos! I loved this tutorial!! My 15 year old niece is going to be Cinderella and now I know exactly how to do her makeup!! Thank you so much Kandee for all your wonderful tips and videos, I've seen them all! I think you should do a Marie Antoinette look! Loves it! I wish I could dress up for Halloween this year but I have to work :( Oh well I can live through all of your great, inspiring videos Kandee! Now you must do my favorite Ariel!!!! Happy halloween everyone! I love the princess looks!! I think you should do all of them too!! Can you PLEASE do a tutorial of David Bowie from Labyrinth? Or perhaps Sarah's make-up during the ball room scene? And then can you sing "As the World Falls Down" at the end of the video?????? Gwen Stefani!!! With the 50's hair <3 u! Kandee, it was beautiful! I love it. looks so beautiful! loved the song in the end! thanks so much Kandee, I hope that all of your dreams will come true! lots of kisses to u! This look is so beautifull!Thank you for this video! LOL THIS IS SO ADORABLE ! Well done!I've always wanted to be Esmerelda fro, the Hunchback of Notre Dame. You should try her! so sweet!! little girls would love to be made up by you into their favorite princess! have you ever done any of the dramatic looks from silent movies???? i would love to see your version of theda bara!!! Hi Kandee, Awesome tutorial, as always! Can't wait to meet you at the Toronto Glaminar, you are my inspiration! Goodness me, you're the sweetest thing! I love love love how much you encourage people. You're so beautiful, inside and out. Fantastic tutorial! Oh wow, this is my favorite one so far! I've always had a soft spot for Cinderella. And of course, you look gorgeous as a blue-eyed blonde! I hope you finally got some sleep. Nothing is more frustrated than being exhausted and not being able to sleep. You look GORGEOUS as always. Your eyes look amazing in this pic! so sweet and pretty! the still shot really caught my eye because it looked so much like your mom! beautiful. Oh Kandee! You make me so happy! Please do a Labyrinth look, scarlett ohara, My Fair Lady/Audrey Hepburn, and more Disney like Belle, Ariel, Sleeping Beauty, etc. These tutorials are so wonderful and your passion and joy for life brings joy to mine! Thank you! you have such a beautiful voice,your videos,posts and pictures always brighten my day and make me smile.you truly have a gift! You would have been a great Cinderella, what a voice! I dress as Belle for little girl tea parties. I would love to see a tutorial on Belle! Hey kandee! how did you make your eyes blue!!! what contacts did you use! Come with Me to the English Countryside!!! The Hardest Glaminar Day ever! SNEEK PEEK for next video and VOTE! Where to get my FEATHER EARRING! You can be a princess too! You ready to get SUPREME!? Look how skinny I WAS! ONE HOUR SNEEK PEEK FOR ALL MY BLOG FAMILY!!!! !